The earliest Tarot decks originated in Italy in the fifteenth century, with Italian suit symbols. However the game was very popular elsewhere and tarots with French suit signs, usually called "tarok" or "tarock", appeared around 1750 which are now mainly produced in Austria. 78-card 'Taroquis Marca Obelisco' published by Mario Colombo, Buenos Aires, during the 1950s, 60s & 70s, in the style known as "Tarocco Piemontese" which had been developed by Italian cardmakers during the nineteenth century. The “Tarots Egipcios” was first published by Editorial Kier S.A. in c.1971 with Spanish titles, with a booklet (also in Spanish) explaining the cabbalistic meanings of the cards. 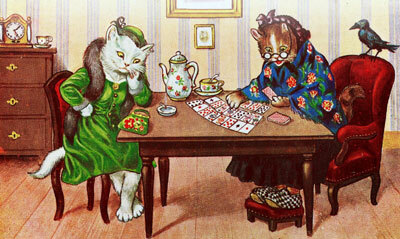 The Thomson-Leng Tarot Cards were issued by the publishers of women's magazines during the 1930s. The cards are loosely based upon the Rider-Waite tarot. "Verkehrte-Welt-Tarock” (reverse world ?) manufactured by Christian Theodor Sutor (fl. 1823-1854), Naumburg, around 1850.